How are you getting into the Christmas spirit? May the Christmas Spirit be with You! 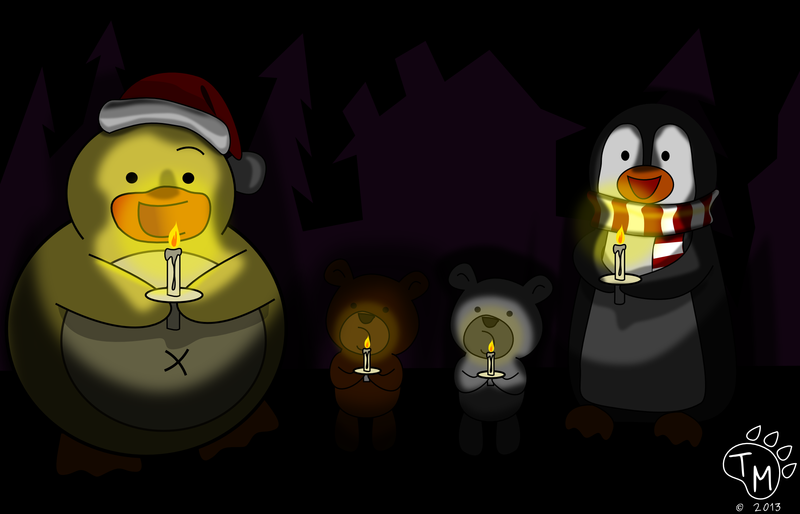 Ducky, Pembleton, and the lil guys want to wish you all a Merry Christmas! I think your stocking might be bigger than mine! How beautiful are your branches! I think your nose is glowing! Yesterday, Ducky and the gang made a batch of practice cookies for the big guy next week. Afterwards, Ducky suggested they also practice placing the cookies out on the table. Pembleton thought this was strange, but went along with Ducky’s idea anyways. Later that night, Pembleton and the little guys heard a strange noise coming from the living room. “Ducky do you hear that?” Pembleton asked. But Ducky was no where to be found. “Ted, Blizzard, let’s go investigate!” Pembleton suggested. 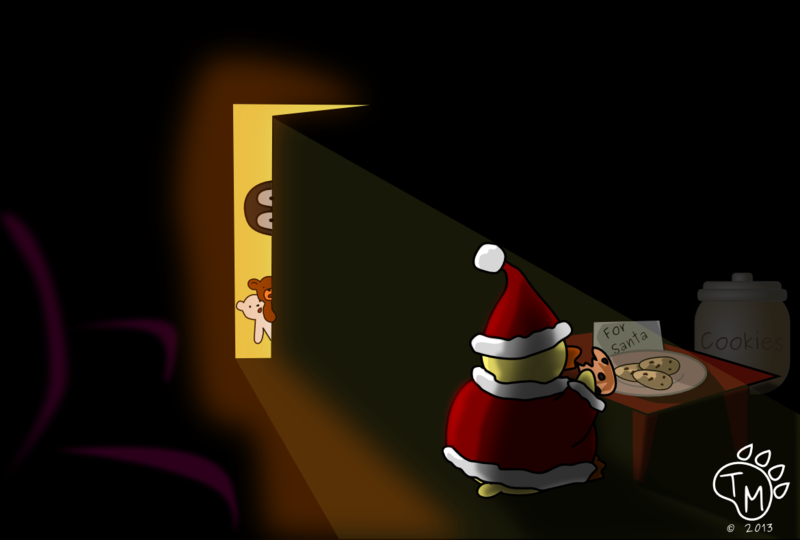 They quietly crept in to the living room, where they thought they saw Jolly Ol’ Saint Nick munching on the cookies, but when looking closer, it was just a Jolly Ol’ Ducky. “You know lying will get you put on the naughty list!” said Blizzard. “Why don’t we eat the cookies together?” Pembleton suggested. “Great idea!” Ted and Blizzard cheered as they joined Ducky around the cookie plate. Ducky and the gang have been practicing and practicing for the up coming nativity play. Pembleton not only had the lead as Joseph, but he was also directing the play as well. This did not sit well with Ducky. He wanted to be the lead and he did not like Pembleton bossing him around. Since Ducky was unable to be Joseph, he decided he wanted to be one of the three wise guys. He has been wanting to wear his Blues Brothers outfit again. But Pembleton just gave him an angry glare and said he had been cast as the angel. An Angel! Ducky knew this was the role he was born to play. He was going to be the BEST ANGEL EVER! Hopefully Ducky will have it straightened out before their first show tomorrow. Now that Thanksgiving is behind us, it is Ducky and the Gang’s favorite time of year! One of their favorite Christmas traditions is caroling, so today the gang decided to stroll around the park singing cheery songs to celebrate the season. Over the holidays we have been very busy! Ducky and the gang have seen parts of the United States they have only read about or seen on T.V. It has been a very exciting adventure for them. After spending some time in Florida, they traveled up the east coast visiting Georgia, South Carolina, North Carolina and Virginia. They spent their New Years celebrating in our nations capitol Washington DC! but 2013 is going to be even more AWESOME! What happen to the “S”? Is North Carolina next to the North Pole? I can’t wait to eat some Virginia Peanuts! Yesterday Ducky, Pembleton, and the Little guys had their first visit to Disney World! They had so much fun. First they went to the Magic Kingdom where they went on the Pirates of the Caribbean ride, the Jungle River Trek, Splash Mountain, Thunder Mountain, Space Mountain, the Tea Cup ride and so much more. Their favorite part was the Christmas Parade! The floats even smelled like Christmas! They also went all around the world in Epcot; enjoying sights and sounds from China, Morocco, Norway, and so many others. They even got to stop by Animal Kingdom to see the Tree of Life and ride Expedition Everest. Then they finished at the Magic Kingdom where they saw Celebrate the Season, Celebrate the Magic, the Electric Street Parade and finally their night ended with fireworks! One more day til Christmas! Cinderella’s Castle about to be stormed by Ducky and Pembleton! Pooped after a long day of fun and excitement! *More pictures to come… unfortunately the internet at the hotel is S-L-O-W! During the Holidays it is important to think about those less fortunate than you. This year, Ducky and the gang bought gifts to give to the local Animal Humane Society. Ted and Blizzard were so excited to be spreading Christmas cheer to their buddies! Pembleton brought flea medicine and new colorful collars with matching leashes for everyone. Blizzard brought several balls of yarn for the kittens. Ted brought tennis balls for the puppies. And Ducky brought homemade baked cookies for everyone! The cookies almost didn’t make it to the tree, but thankfully Mrs. Lamb wrapped them up before he could eat them all. 4 more days til Christmas! Ducky and the gang had a special visitor earlier today. While on a practice run for the big night next week, Rudolph the Red Nosed Reindeer stopped by to say “hi”. He joined Ducky, Pembleton, Ted, and Blizzard for some reindeer games. They played leap frog, ring around the rosie, “duck, duck, Ducky” and “who can jump the highest”. They shared lots of laughs before Rudolph had to head back to the North Pole. The Lambs took time off from bell ringing this Christmas season, to do a little shopping and celebrating of their own at a German Christmas Market. They had some Lebkuchen (a type of soft gingerbread cookie) and hot cocoa. They bought each other some nice German crafted gifts and some wooden toys for the Animal Humane Society’s Angel Tree. Ducky, Pembleton, Ted and Blizzard had their first snow day of the school year yesterday. They were so excited. They had just seen Frosty the Snowman on T.V. Even though they do not have a magic hat, they still wanted to make a new winter friend. Pembleton made the base, Ducky made the middle, and the little guys tried to make the head, but they needed a little help. Pembleton got a latter and placed the head on top. Ted added the eyes, Blizzard added a smile, Pembleton added the nose, while Ducky added the arms. After the snowman was complete, Ducky thought it would be fun to have a SNOWBALL FIGHT! He scooped up a ball of snow and hurled it at Pembleton. It was a direct hit. Pembleton at first was shocked and then he laughed. He is the fastest snowball maker in town and within seconds he was ready for his attack. Their winter wonderland was transformed into a snowy battle. Afterwards, they came inside to warm up by the fire and have some hot cocoa. Pembleton belongs to an amateur ham radio club with animals from around the world. Every year their ham radio club puts on a Christmas production. Unlike usual Christmas parties, the ham radio club performs a play over radio. All of the animals in the club are assigned characters and each animal reads their lines into a microphone that sends their voice to all the other members of the club. Ducky, Ted, and Blizzard gathered in Pembleton’s study to listen to the story unfold. This year’s play, written by Pembleton, was a mystery revolving around missing Christmas presents stolen from an orphanage. The hero of the story was Detective Lionhart played by Lionhart the Tortoise, while Pembleton played the villain, Baron von Despicable. At the end of the play Ducky, Ted, and Blizzard cheered when Detective Lionhart caught the Baron and delivered the stolen presents to the orphanage just in time for Christmas morning. Can’t Catch Me! I’m the Gingerbread Man. At school, Ducky and the gang were busy decorating their Gingerbread Men Cookies! Penelope the Penguin worked very quickly making a pink skirt and using pink gumdrops for the eyes and buttons. Amanda Panda used purple gumdrops and icing for her cookie. She wanted to kept telling Ducky, Pembleton, and Penelope that her gingerbread woman was a fashion model. Ducky’s gingerbread man turned out a little crazy. More frosting made it onto the table and into Ducky’s mouth than on his actual cookie. Mrs. Cottontail had to come over and warn Ducky to stop squirting the icing into his mouth. Pembleton took the longest time, because he was planning the perfect decorations. In fact, he only started laying down the first lines of icing after all the other kids were almost done. When they were done decorating, Mrs. Cottontail passed out paper cups with milk and they ate their cookies, except for Pembleton, who ate his cookie five minutes after everyone else because he was still finishing his cookie decorations. 19 more days til Christmas! Ducky and the gang are still decorating for Christmas. They enjoy adding something new each day as they count down til Christmas. Today they are making sure their stockings are hung with extra sturdy nails for all the goodies Santa will fill them up with on Christmas Eve. 21 more days til Christmas. 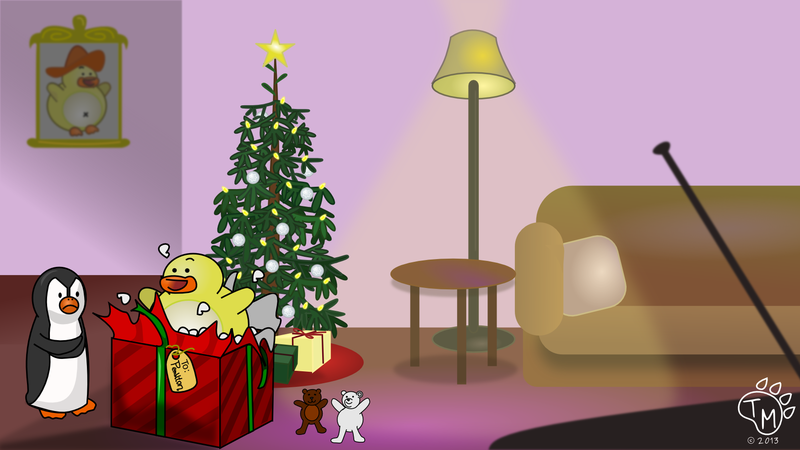 This weekend, Ducky and the gang were busy decorating their beautiful Christmas tree that Ducky picked out last Friday. They put in their favorite Christmas movie, the Muppets’ Christmas Carol, and untangled all the lights. They wrapped the tree with lights. Then carefully unpacked the ornaments and found the perfect branch for each one. After Pembleton placed the star on top and Ducky placed a few presents underneath the tree, the gang turned down the lights to marvel at the tree. Only 22 days til Christmas!